It is no doubt that American music plays an important role in the international pop music stage. Most of pop music types like Jazz, Country, Blues, Rock and roll, Soul all originated from America in 20th century, then became very popular throughout the world. On Sunday, Aug. 24/25, The mini Festival hosted by Sennheiser Shanghai Concert Hall will return to public bringing three heart-stirring concerts and three lectures in 2 days concentrated on 20th century American pop music. During the festival, musicians coming from America will perform 20th century golden songs, such like What a wonderful world，Fly me to the moon, Yesterday once more, etc. It has to be mentioned that the performers all employed by or graduated from Berklee College of Music, ‘the cradle of Grammy Awards ‘, which has educated lots of pop music superstars and masters like Whitney Houston, Mariah Carey and John Mayer. 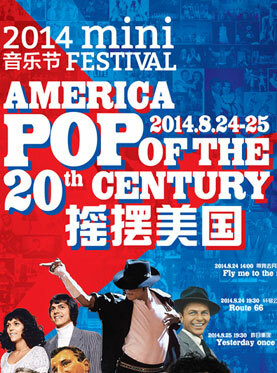 These three concerts in Shanghai will present a creative and innovative interpretation of the history of American pop music in 20th century.